What platforms and software will SIL fonts work in? SIL fonts will work on Mac OS X, Linux and Windows. However, keep in mind that more recent versions (such as Mac OS x v10.8+ and Windows 7+) give the best support. The other key to successful rendering of complex fonts is the support given by the application you are using. Can you help me get a font working on my system? We cannot afford to offer individual technical support. The best resource is this website, where we hope to offer some limited help. However, we do want to hear of any problems you encounter, so that we can add them to the list of bugs to fix in later releases. Please go to the Support page to report any problems. Please understand that we cannot guarantee a personal response. Can I use one of the SIL Arabic script fonts on my web site? Yes. You can create web pages that request that SIL Arabic script fonts be used to display them (if that font is available on the user’s system). According to the license, you are even allowed to place the font on your site for people to download it. We would strongly recommend, however, that you direct users to our site to download the font. This ensures that they are always using the most recent version with bug fixes, etc. In the download package for each font we provide a WOFF font. See Using SIL Fonts on Web Pages for instructions on using fonts on web pages. I am using a TypeTuned font that I would like to use on my web site. Can you provide a TypeTuned WOFF font for me? The great thing about web fonts is that you can use our standard normal fonts and let the CSS on your page handle the special alternate glyphs or behaviors that you are looking for. See Using SIL Fonts on Web Pages — OpenType and Graphite feature support for instructions on using font features on web pages. How do I use Arabic script in Microsoft Office? The ability to display right-to-left (RTL) and other complex scripts is built into the standard editions of Microsoft Office since Office 2000. These instructions are written for Office 2016 on Windows 10. However, similar steps can be taken on older applications and versions of Windows. First, close any Office applications that are open. Next, you must enable an Arabic language in Microsoft Office 2016 Tools / Office 2016 Language Preferences (in the Start menu). Click on Add additional editing languages and choose one of the Arabic languages. Then click on “Add”. The Keyboard Layout will say “Not enabled”. If you think you’ll need to type in Arabic, now would be a good time to double-click on that and select an Arabic keyboard. Now you can open Word. If you go to File / Options / Advanced you can select Cursor movement under Editing options. Under Show document content you can choose whether you want “Arabic” or “Hindi” numerals, choose to show Diacritics in another color if desired, and you can choose to set the Document view to Right-to-left. All of these choices affect your whole document. Click on OK.
It’s also possible to just set Paragraph direction for one or more paragraphs in your document. You should now have a Right-to-left and Left-to-right icon selection. To do that, choose the Paragraph marker with triangle pointing left for setting text to be Right-to-left. This should also automatically change the paragraph to “Align Right”. This will get you a long way toward using Arabic script in Microsoft Office. There are sometimes other issues and if you run into problems, you will likely want to use the document template that we have created and linked to below. In the link below, a document template provides helpful hints on use of RTL scripts in Microsoft Word 2000 or later. Included are general instructions for getting such scripts to work correctly, known bugs and weaknesses, and various tips and tricks. There are also some macros that may be helpful when working with RTL scripts. The template is available here: Right-to-left scripts in Microsoft Office. How do I use Arabic script in InDesign? There are several settings you must check in order to have proper rendering in InDesign. First of all, in the Character widget, you should make sure your text is tagged with the Arabic language. The Opentype Contextual Alternates should be selected and Kerning should set to Metrics or “0”. The default for Kerning seems to be Optical, but when that is set there might be tiny spaces between the characters which you do not want. Next, in the Paragraph widget, make sure your text is tagged with the Adobe World-Ready Paragraph Composer and possibly set your text to Align Right. You do not need Indesign ME or World Tools to get RTL working properly in Indesign. You can edit the Windows registry and change the Feature Set Locale from 100 to 103 to get most of what you need. First, please backup your registry in case you run into problems. Instructions for backing up your registry are available here. Next, using regedit (type the Windows key, type in regedit and hit enter), go to the InDesign Feature Set Locale Setting. A 32-bit machine registry is a little simpler to find and change. Once you do this, when you open InDesign you will have access to the ME paragraph settings. See below. How do I use Arabic script in InDesign ME? Select Paragraph settings. Make sure that the InDesign ME diacritic positioning is using the OpenType setting. How do I use Arabic script in LibreOffice? There are probably many levels to this question. We’ll start by getting you set up properly in LibreOffice. 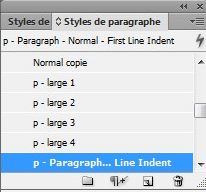 First of all you should enable Complex Text Layout (CTL) in LibreOffice. Do this by going to Tools > Options > Language Settings > Languages. Then click on Show UI elements for Bi-Directional writing. Then go up to CTL and select an Arabic language such as Arabic (Saudi Arabia). Click on OK.
Next, you should go to View > Toolbars and make sure Formatting is selected. You should now see the Right-to-Left (RTL) button. You may need to restart LibreOffice before these buttons show up. Now, when you have Arabic script text you should make sure to select the text and click on the RTL button. This will ensure that all (or most) of your RTL directionality issues (such as punctuation and numbering) are resolved. If you wish to input Arabic script text you will also want a keyboard. You can either choose one of the operating system keyboards or if you have a Keyman keyboard you should associate it with an Arabic script language (such as Arabic (Saudi Arabia)). Associating your keyboard with Arabic (Saudi Arabia) should make LibreOffice switch to the Arabic (Saudi Arabia) language when you select your keyboard. I am experiencing what appears to be corruption of my data in LibreOffice when I use one of your fonts. What is the matter and how do I fix it? It is important that you have the latest version of LibreOffice installed as that fixes some potential bugs. These various versions of the font will not show up if you just go to your font folder in Windows Explorer, they only show up if you go to the Command Prompt. It is important to get rid of all of these, reboot and then reinstall the latest version of the font. Hopefully that will resolve your problem. How do I get U+06DD (End of Ayah) and subtending marks (U+0600..U+0605) to work properly with digits? These Arabic characters are intended to enclose or hold one or more digits. Many applications are able to display these properly, just by typing the subtending marks (such as the End of Ayah) followed by the digit(s). This will not work unless you’ve already turned on Right-to-Left support in your application (discussed in above Question and Answers). How do I get correct display for “Chapter:Verse” references using a regular “Roman” colon? Digits can display in different orders, depending on the punctuation around them. This was tested in LibreOffice and NotePad. It is important to insert the marks in both positions in order to have consistent behavior across different applications. Unfortunately, Word has its own issues with how it handles this. The Right-to-left scripts in Microsoft Office template will be useful to read and use for Word documents. Some of the characters in the Arabic Supplement block and none of the new characters in the Arabic Extended-A block are rendering correctly. How can I resolve this problem? The font supports Graphite rendering. See this page for a list of all applications supporting Graphite rendering. The font also supports the OpenType shaping features specified by Microsoft. The result is that the fonts work pretty well in Microsoft Office XP (or later) as well as in most Uniscribe-based applications. Uniscribe in versions of Windows prior to Windows 8.1 does not include support for Unicode 6.1 and so does not support the Arabic Extended-A characters (U+08A0..U+08FF), nor a few new characters in the 06xx block. Windows 8.1 supports all Arabic script characters through Unicode 6.1 (including the new Arabic Extended-A characters). Mozilla’s Firefox and Thunderbird do provide OpenType support for the new Arabic Extended-A characters. International Components for Unicode (ICU) includes a shaping engine for Arabic text and thus applications such as XeTeX 2012 (and earlier) that use ICU Layout will be able to render text using SIL’s Arabic fonts. The ICU Layout library used in XeTeX (TeXLive 2012) has been updated to support the Arabic Supplement characters added in Unicode 5.1 (but not 6.1). XeTeX (from TeXLive 2013 on) now supports the HarfBuzz shaper which supports Graphite as well as all Unicode characters through Unicode 6.1. The rendering engine in Adobe’s InDesign CS6 has also been updated to support the Arabic Supplement characters added in Unicode 5.1 (but not 6.0, 6.1, 7.0 or 8.0). How do I use a language feature? Our fonts support features for up to four languages. For example, Scheherazade supports Urdu, Kurdish, Sindhi and Rohingya. If the application you are using supports the language, then you can select the text, select the appropriate font and then select the language. 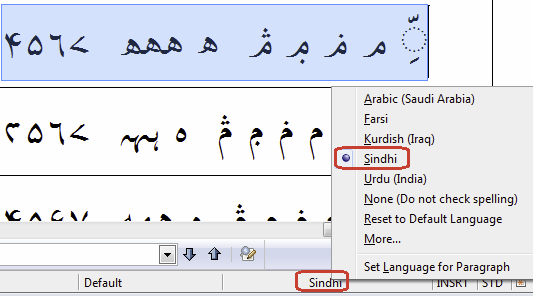 If you select “Sindhi” then the appropriate glyph variants for Sindhi should display. How do I use a feature in Microsoft Word or Publisher? Most of the features in our Arabic fonts use a feature called Character Variants. Microsoft does not currently support Character Variants. However, Office applications do support language features. See “How do I use a language feature?” above. How do I use a Graphite feature? In a Graphite-enabled app where there is a proper UI: you can select the desired variant from the Format / Font / Feature menu (or however the interface is arranged). In LibreOffice the font features can be turned on by choosing the font (ie Scheherazade), followed by a colon, followed by the feature ID, and then followed by the feature setting. So, for example, if the “Meem: Sindhi-style” is desired, the font selection would be “Scheherazade:cv44=1” (see the features document for the specific font). If you wish to apply two (or more) features, you can separate them with an “&”. Thus, “Scheherazade:cv44=1&cv72=1” would apply “Meem: Sindhi-style” plus the “Dammatan:Six-nine” feature. How do I use a feature in InDesign? How do I use a feature in XeTeX? The XeTeX typesetting system supports language features, OpenType Stylistic Sets and Character Variants as well as Graphite features. Include “feature=setting” pairs in the font specification within the source document or stylesheet; e.g., fontbodytext=""Scheherazade/GR:Meem=Sindhi-style on baseline" at 12pt. The syntax for this can be derived from the Font Features document for the specific font you are using. How do I use a feature in a browser using CSS? In Mozilla Firefox, with either Graphite or OpenType rendering, features can be accessed using the appropriate CSS markup. A description of how to use the font features in Mozilla Firefox can be found here: Using Graphite in Mozilla Firefox (the technique described there works for both Graphite and OpenType). This syntax is required for the variant glyphs to display in Chrome, Firefox and Internet Explorer. What do I do if I’m using an application that does not support features? Currently, the only alternative is to create derivative fonts that have the desired behaviors (e.g., alternate glyphs) “turned on” by default. So one could imagine a font such as “Scheherazade Sindhi” that is just like Scheherazade except that the Sindhi alternates have been turned on. We have created a tool called TypeTuner Web which you can use to create derivative fonts. Will font and glyph metrics stay the same in future versions? We do not guarantee to keep metrics stable in future versions. The practical result of this means that you should expect to have different line lengths, paragraph length may be different, and line spacing may even be different. You should not expect your document to have the same page layout as you do with the current font. I want to use one of your fonts in my publication – can I? All of our current Arabic script fonts are released under the SIL Open Font License, which permits use for any publication, whether electronic or printed. For more answers to use questions see the OFL-FAQ. The license, alongside information specific to the font, is in each font release package. Are the SIL Arabic script fonts going to stay free? There is no intention to ever charge users for using the SIL Arabic script fonts. The current versions are licensed under SIL Open Font License (OFL) and future versions will be similar. I would like to bundle one of the SIL Arabic script fonts with my application – can I? The SIL Open Font License allows bundling with applications, even commercial ones, with some restrictions. See the OFL web page. Can I make changes to your fonts? Yes! That is allowed as long as you abide by the conditions of the SIL Open Font License. Can I send you work I’ve done to be incorporated into the SIL Arabic script fonts? Yes! See the FONTLOG for information on becoming a contributor.